In an extra driving force to pressure Obama to outright reject the controversial Keystone XL pipeline, a coalition calling themselves the Cowboy and Indian Alliance has been formed. 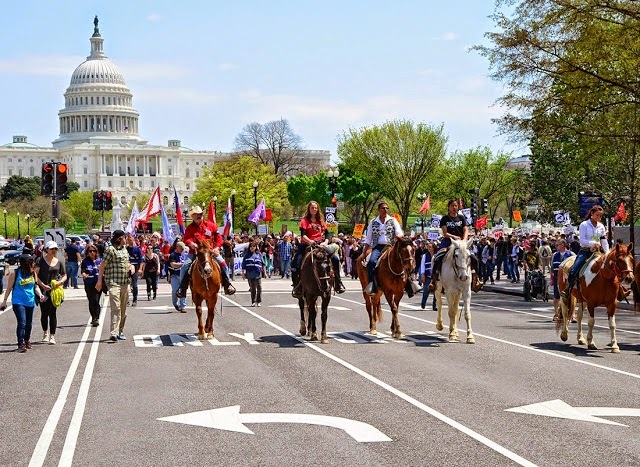 In Washington, DC Thousands of people joined the farmers, ranchers, and tribal leaders of the Cowboy and Indian Alliance for a ceremonial procession along the National Mall to protest the Keystone XL pipeline Saturday last week. The procession is part of the five-day “Reject and Protect” encampment. The Cowboy and Indian Alliance is a coalition formed by ranchers, farmers and tribal communities all with the common goal of fighting the Keystone XL pipeline, which Obama recently postponed the decision on again. The alliance also got the backing of the large environmental networks 350.org and the Sierra Club, as well as the group Bold Nebraska who have been fighting Keystone XL in Nebraska. But there was hope and optimism that the delay of the pipeline is good for the movement. Meghan Hammond, a sixth-generation Nebraska rancher said: “Every time Keystone XL gets delayed it just gives us more time to speak up and tell the truth about this dangerous pipeline’’. Ms. Hammond is, along with her family, working on building a crowd-funded clean-energy powered barn on her property which will sit directly on the proposed route of Keystone XL. The Cowboy and Indian Alliance have said this is only the beginning, we can expect to hear much more from them. In true Cowboy-style, expect the alliance to saddle their horses and ride into the horizon to protect what they rightfully see as their land.